The market is overflowing with the end of season harvest. And when faced with a good deal, I can hardly ever walk away….like 10 eggplant for $3! well thank you….but now…I have 10 eggplants. Hrmmm. 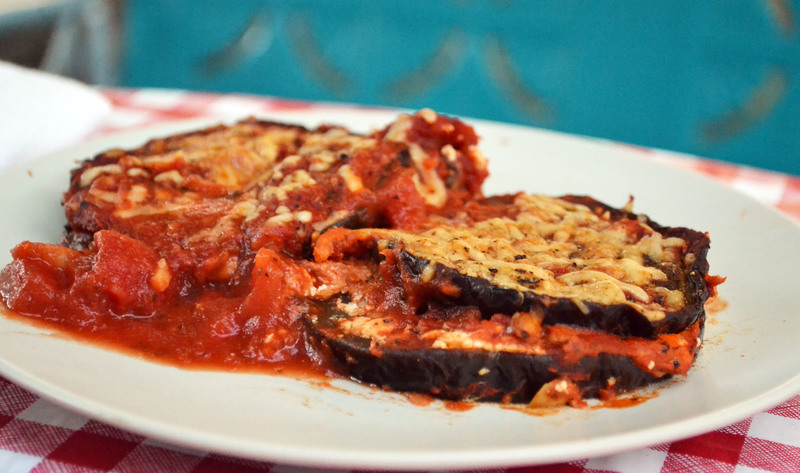 Eggplant parmesan is typically breaded and fried. Which, yes…delicious. But, I opted for a lighter version with loads of flavor. This recipe is so delicious and allows you to taste the eggplant instead of BREADING. There is a debate on whether to pre-salt your eggplant to remove the bitterness and draw out excess water….do it if you have time, but it isn’t entirely necessary. 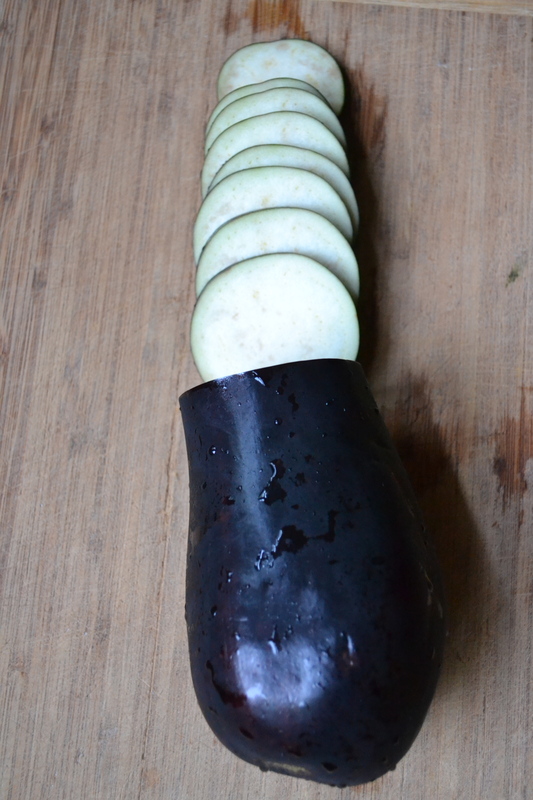 To presalt the eggplant, lay eggplant slices in a single layer in a colander and apply salt liberally. Let sit for 15 to 30 minutes. Rinse and pat dry. Now lets talk cheeeeese. I’m in deep smit with goat cheese…so I add it to EVERYTHING….egg sandwiches, pizza, burgers, quinoa, my face…. It is creamy and provides a lot of flavor for less calories than other cheeses. But, if you aren’t a fan or don’t have it on hand….leave it out and you can either sub mozzarella or even feta for a punch of flavor. Preheat oven to 375F. Lightly brush olive oil on both sides of eggplant slices. Lightly season both sides of eggplant with salt and pepper. Spray a baking sheet with nonstick spray. Place eggplant in a single layer on baking sheet. Bake for 10 minutes, until browned. Flip and cook an additional 5 to 10 minutes. Remove from oven. Spray an 8×8 inch baking dish with nonstick spray. Spread 1 cup of marinara sauce on bottom of baking dish. Arrange half the eggplant on top of the marinara sauce. Cover with 1/2 cup of sauce and goat cheese and 1/4 cup of parmesan. Repeat with remaining eggplant and marinara sauce and parmesan cheese. Bake for 25 minutes or until sauce is bubbling and cheese is melted. Let stand for 5 minutes before serving.